The first picture is of the letter I responded to. I could not find a link to it. This is a link to my letter. 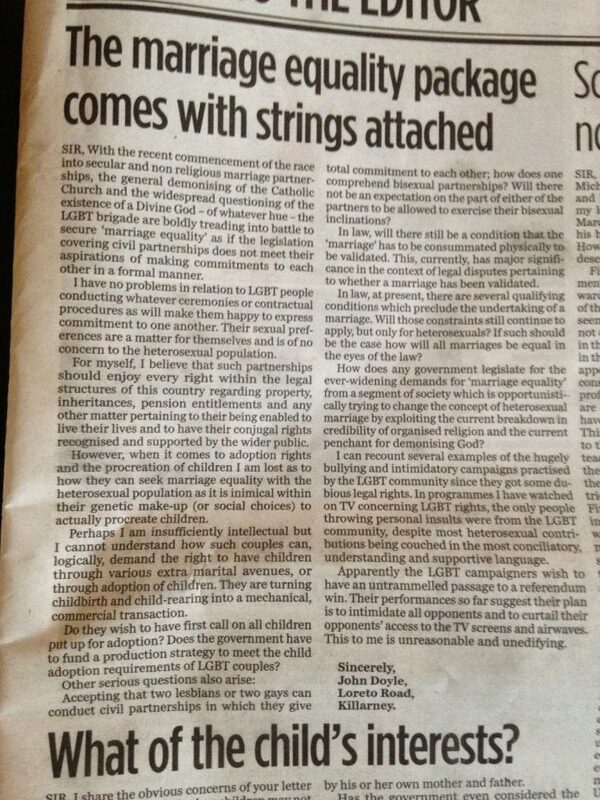 I write in response to John Doyle’s (March 18) impressively crafted letter attacking marriage equality. While I’m certain Mr Doyle’s concerns regarding the LGBT community are genuinely felt, it’s important to consider just how little LGBT people are asking for in this referendum. They are merely asking to have the same rights as my wife and I enjoy. What are those rights exactly? Well, my wife and I got married in a Registry Office. That’s it. That is all there is in the marriage equality referendum. And while children are not mentioned in the referendum, sure let’s discuss them anyway. My wife and I are free to choose whether or not to have children, but this right was not granted to us on marrying. We were always free to have children. 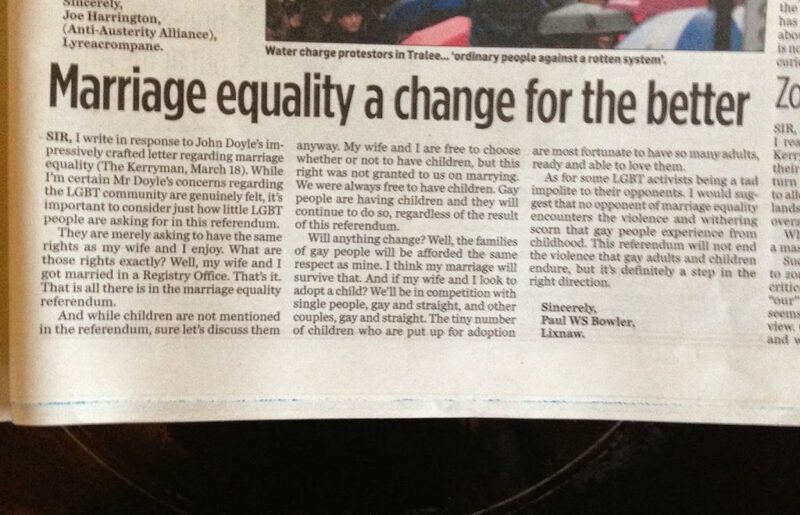 Gay people are having children and they will continue to do so, regardless of the result of this referendum. Will anything change? Well, the families of gay people will be afforded the same respect as mine. I think my marriage will survive that. And if my wife and I look to adopt a child? We’ll be in competition with single people, gay and straight, and other couples, gay and straight. The tiny number of children who are put up for adoption are most fortunate to have so many adults, ready and able to love them. As for some LGBT activists being a tad impolite to their opponents. I would suggest Mr Doyle try a bit of Christian charity. No opponent of marriage equality encounters the violence and withering scorn that gay people experience from childhood. This referendum will not end the violence that gay adults and children endure, but it’s definitely a step in the right direction.